Growing up in Hawaii, I've had few chances to see the color changes of fall, but I've romanticized about it. 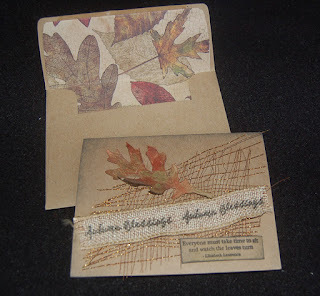 Creating autumnal cards is my way of celebrating the season. The kraft paper 50 pack blank note card set from Sierra Pacific is the perfect base for the warm color tones of fall. 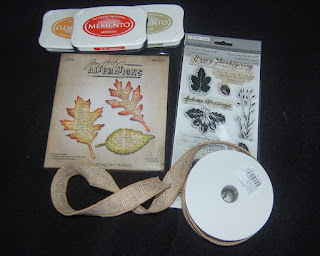 I started with the envelope and used the Tim Holtz tattered leaves die to cut one leaf out from the flap. At first I was just going to back the cut out with printed paper but then I thought that a lined envelope would look more elegant. Making a lining for an envelope is easy, just trace the opened envelope and cut it out. Trim the lining to fit the envelope, cutting off the bottom (about 1") so that the lining will sit below the gummed edge. Using a double-sided printed paper would be best for a for a cut out envelope lining, but I wanted to use a single-sided autumn leaf paper so I just cut out a second flap and glued it behind the cut-out flap. Does that make sense? For the card I simply glued down a bit of woven material (from the floral department of Ben Franklin Crafts). Next I printed a piece of burlap ribbon (also from BFC) with the words Autumn Blessings. 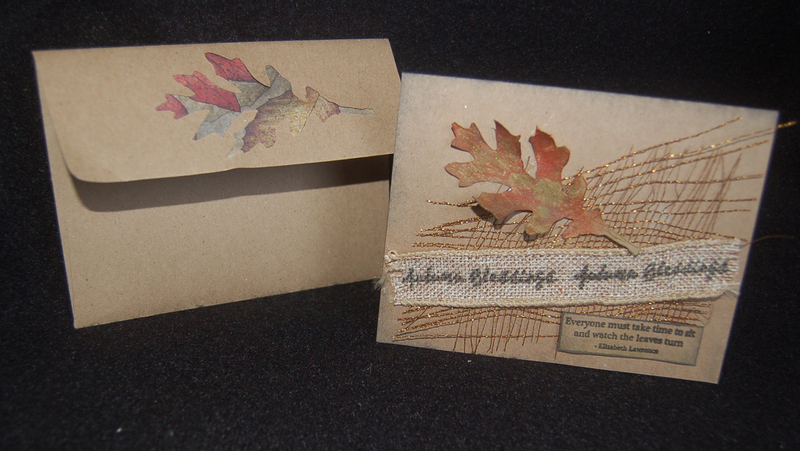 After gluing down the ribbon, I adhered the leaf that I cut out of the envelope and dyed by smudging Memento ink on it. 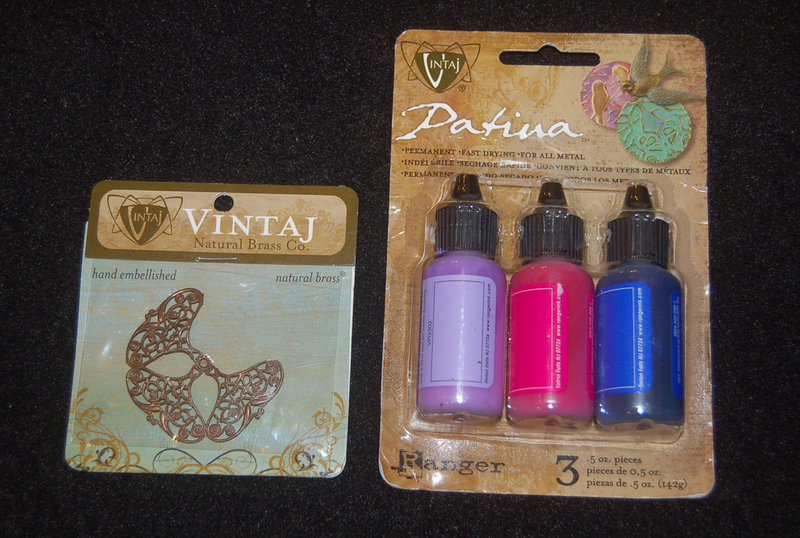 (Ben Franklin Crafts has a good selection of fall and vintage colored inks.) 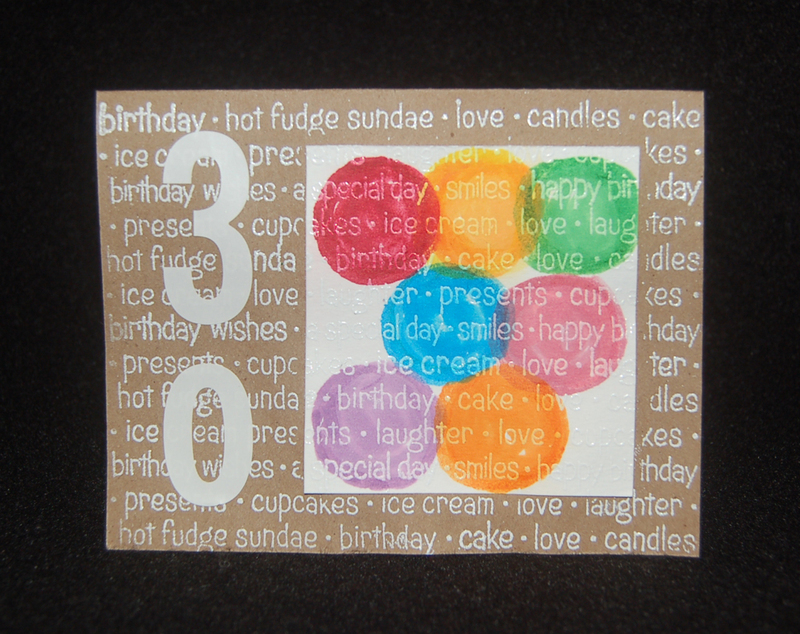 Next, I stamped a quote onto a small scrap of kraft paper, smudged the edges with ink and used sticky dots to fasten it onto the card. Finally, to highlight the edges of the card, I applied ink sparingly using a paper towel covered finger. 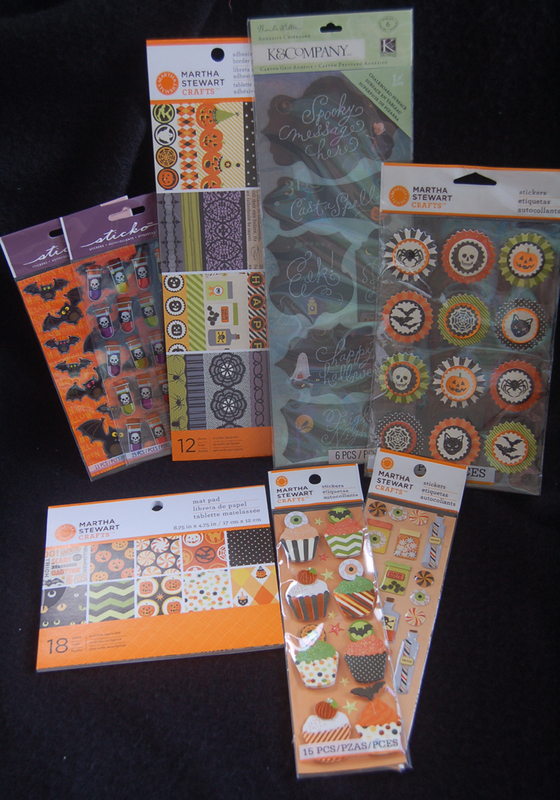 The autumn words I used came from a TPC Studio clear stamp set, but you could use any of the numerous fall themed sets available at Ben Franklin Crafts. Be creative and celebrate the season of change! Sorry that I haven't kept up with blogs recently. I spent a week in Honolulu and the laptop was not functioning well at the hotel. I read some of your posts on my iphone but didn't do much commenting. I'll try to catch up. Anyway, I popped into the Celebrations store (a few doors down from the Mapunapuna Ben Franklin Crafts) to see what new stuff had arrived. I purchased some new treat/lunch bags and more raffia ribbon. I also noticed the store is now selling some instructions for gift wrapping. I got the one for making the crane package (featured on the Joy of Crafting channel 12 Sunday 6:30 pm) and it was only 99 cents! Also at the Celebrations store are super cute Halloween treat bags, stickers, and printed tapes. Even though trick-o-treaters don't stop at my house, I do plan to make some goodie bags to give to friends. The Japanese graphics on the Halloween products are so 'kawai' and as I mentioned last year, the Japanese are really starting to celebrate the playfulness of Halloween. 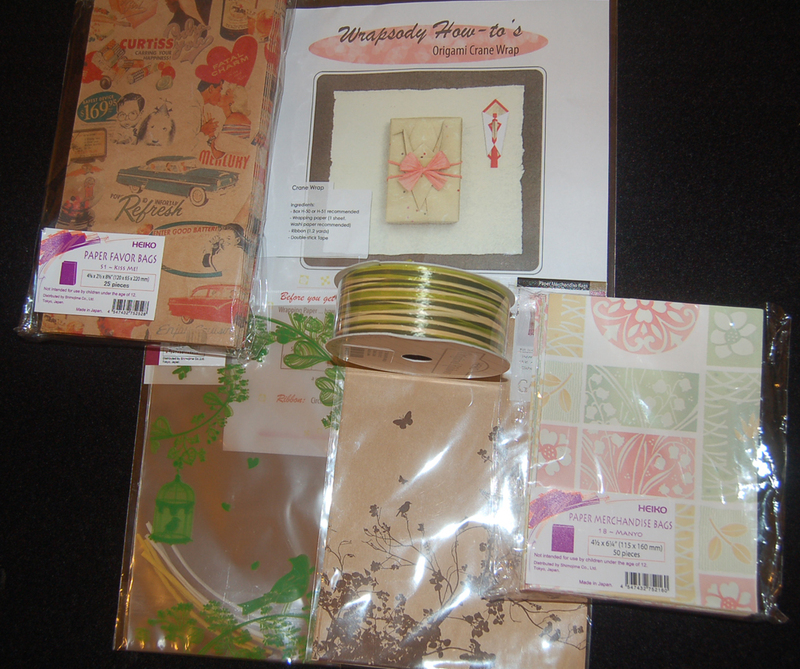 Finally, check out the Celebration store for gift wrapping inspiration and you can even pick up some FREE instruction sheets like the one I got for making a baby onesie card carrier. Happy crafting and gift giving! I've been subtly told by my sons that my birthday cards for them are a bit childish and sometimes girly. By starting with a blank kraft paper (Sierra Pacific) card that I bought in a 50 pack set from Ben Franklin Crafts, I thought that I had a good beginning for a manly card. Looking to other bloggers for inspiration, this is what I created for my son. (Yes, I was 10 when I gave birth to him!) First, I used double stick tape to adhere a square of watercolor paper to the card. Next, I printed the words (Hero Arts background stamp) in white ink over the entire card and heat embossed it with white detail embossing powder. Then I used Copic pens to draw circles on the slightly dampened watercolor paper square. You should experiment with other markers and papers to get the kind of color bleed that you desire. For the final touch I added the number stickers. This masculine(?) card was easy to do and surprisingly pleasing to me (I usually love girly-girl and bling-bling). I hope you'll give this technique a try. Happy card crafting! (found in the fabric printing section of the store). I was excited to find the neutral colored pouch (with green leaf) from Sierra Pacific (other products shown in previous post) because I knew it was the perfect match with the Inkadinkado set. 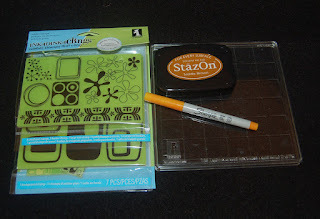 Along with the stamp set I purchased an Inkadinkado acrylic grid plate which allows me to accurately position the stamp. The ink I used was saddle brown Staz-0n. 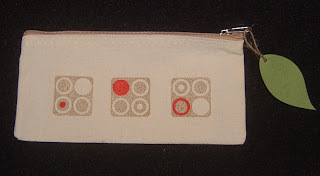 There are many stamping inks which are permanent on fabric and say so on the ink pad cover. I colored in the printed design with a yellow orange Sharpie pen (but it looks red). Be sure to put some paper inside the pouch before stamping and coloring to prevent the ink from bleeding through the fabric. 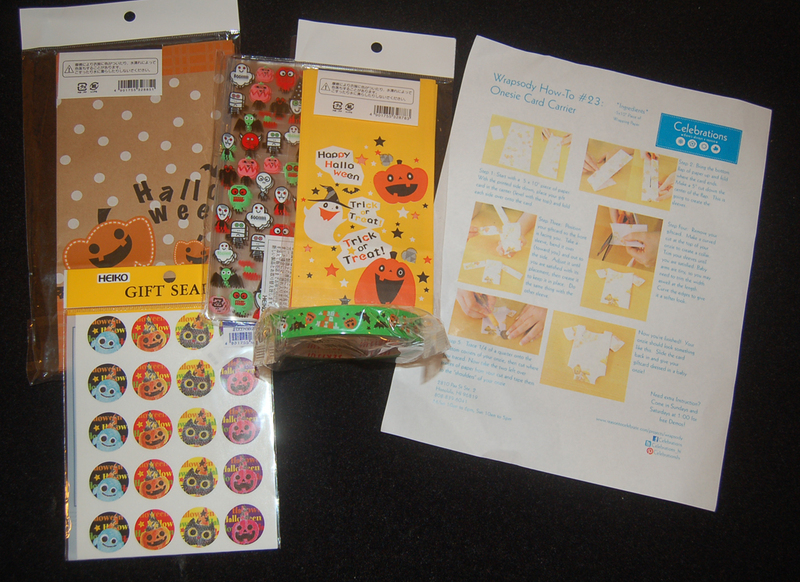 There are many other Inkadinkado bold, graphic stamp sets which can be used to print on the SP products. 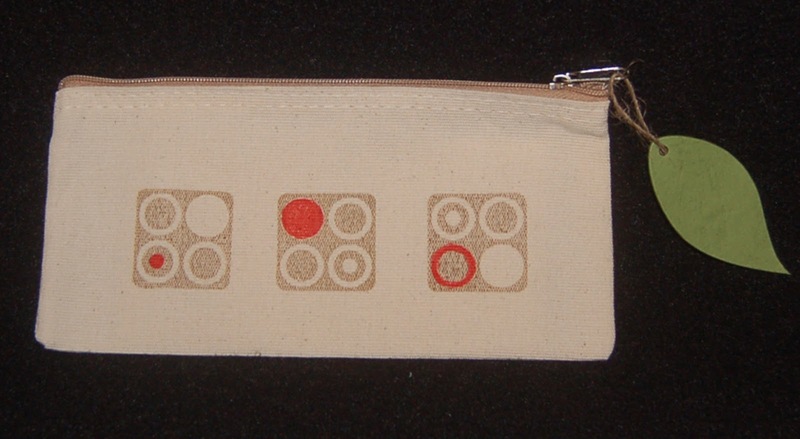 I like that the overall look of the pencil pouch is very fall season, start-of-schoolish. If you stretch your imagination the design sort of looks like apples....LOL! Autumn delights to you! 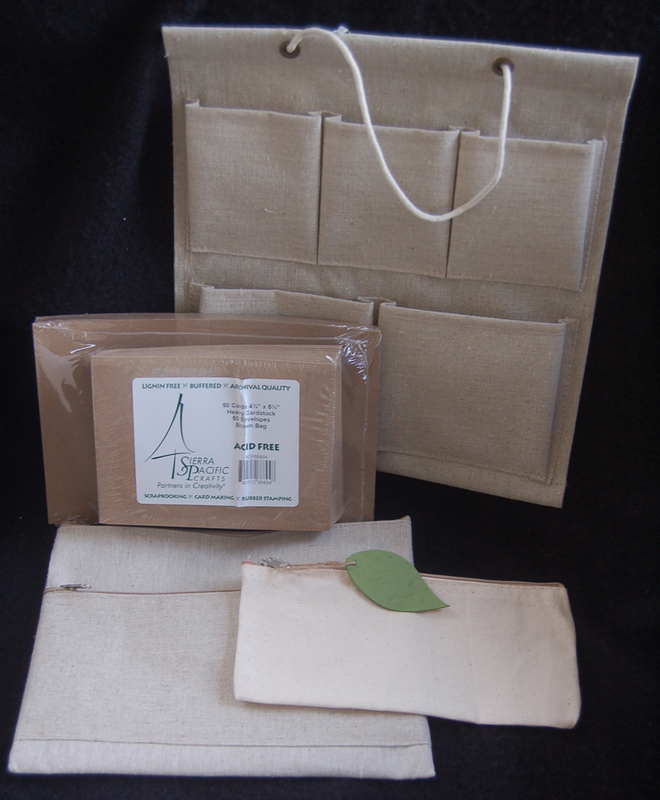 Perhaps it's because fall is on the way, I was immediately drawn to the Sierra Pacific burlap colored blank pouches, note cards with envelopes, and hanging holders. The new items sold at Ben Franklin Crafts just beg to be decorated in fall colors. I've seen some rubber stamps lately that have bold designs which would print well on the fabric using acrylic paints. Also some card makers have been embossing white stamped foliage on kraft paper cards for a truly lovely effect. The Sierra Pacific cards come in a generous 50 count pack. On the same shopping trip I tried to resist the Halloween aisle, but I seemed to have little control over my greedy little fingers which simply grabbed the colorful new Martha Stewart and EK Success Halloween items. Halloween is such a fun time; I just have to do a little spooky crafting. Visit this blog site again to see what I monsters I create......muhahaha! I needed two small gift baskets for two of my favorite people and I happened to spy two take-out containers that I purchased at Ben Franklin Crafts just because they were so pretty. By folding the flaps inward, the baskets were formed and would hold more treats than the take-out box folded in the normal way. To add more flair I wound pipe cleaners around the handles and tied on a matching ribbon. (My husband preferred the handles unadorned so that might be something to remember if the gift is for a man.) Voila! 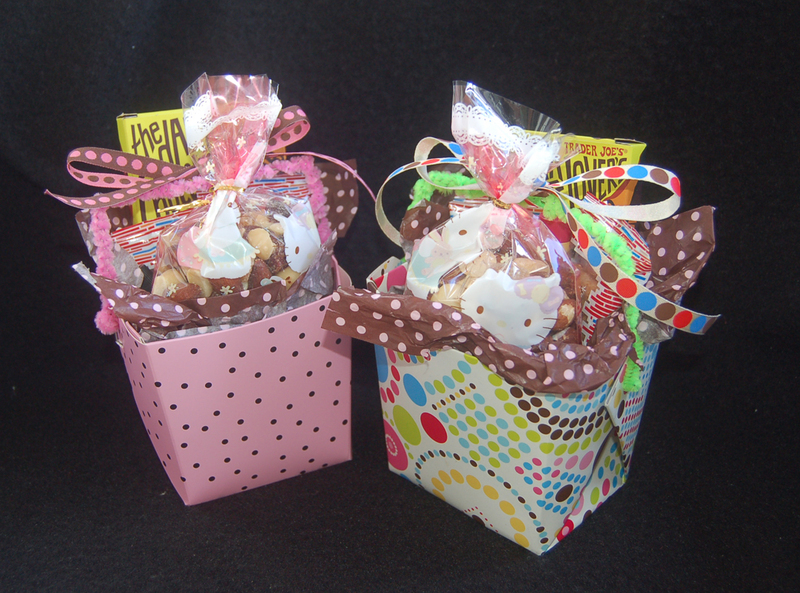 I had instant gift baskets which can be made suitable for many occasions. I think perhaps if you filled a ziploc bag with gel crystals (available at BFC) the basket take-out container would be a quickie bouquet vase for the hostess or hospital patient. Isn't it fun to think outside the take-out box? Sorry I haven't been commenting too much recently, but I was on a 3 week trip in Chicago and Boston. Whew, it's so good to be back in Hilo! It's been a while since I gave away Ben Franklin Crafts gift cards so I decided to do it today. As many of you who follow my blog know, I make it easy and simply randomly select a name from all comments sent to me (this time they are from August) in a month. Every comment is an entry and so those of you who commented the most will have more chances to win. This time I decided to pick a winner from my followers too. 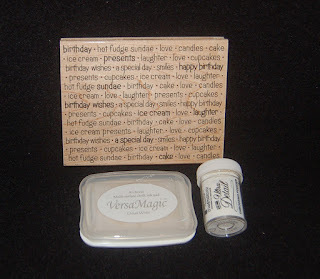 Because the comments are usually followers of my blog and it takes more effort to comment, the BFC gift card amount will be slightly larger for the winner who sent in a comment. Okay, here they are: The lucky commenter is Eunice (A Star for Chemi) and the lucky follower is Cami (Capture a Heart). Congratulations to both of you! If you want a chance to be my next winner simply become a follower of this blog and/or leave a few comments (the more you leave the more chances you have to win). Have a nice crafty day! Oh, how I love embossing metal with my Vintaj plates! To make the process even more thrilling, I discovered how easy it is to enamel the embossed designs with the new Vintaj enamels purchased at Ben Franklin Crafts. These new enamels come in a variety of three color packs and are merely brushed into the embossed recesses, dried and lightly sanded to reveal the intricate Vintaj design. 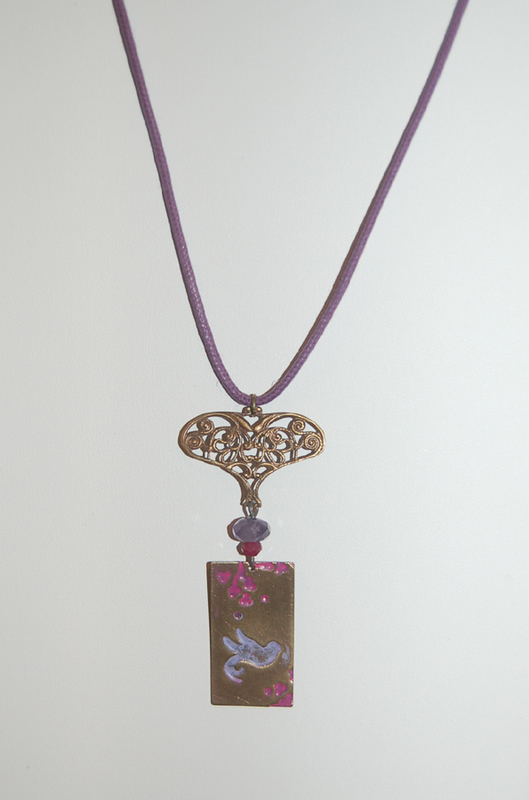 I am particularly fond of the bird design with flowers which I think looks great highlighted with the purple and pink enamels. 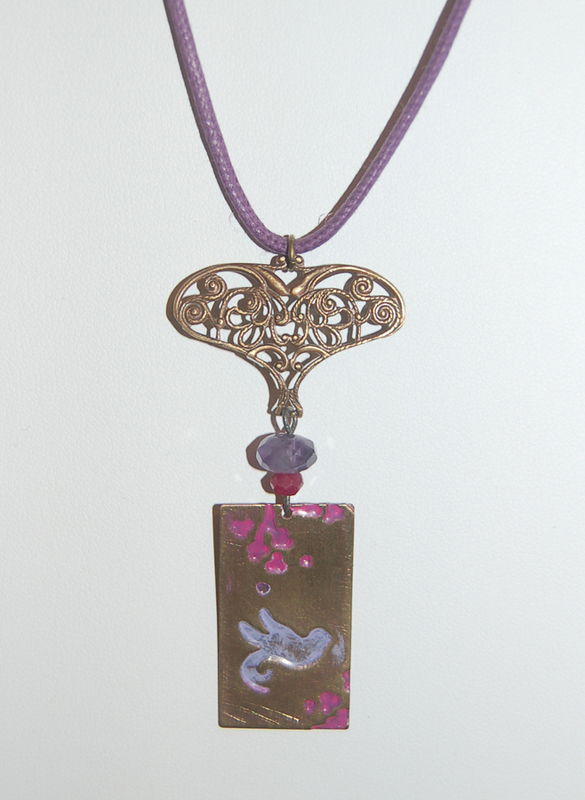 The purple cord I picked is an inexpensive cotton one and the fancy piece over the rectangle pendant is a snipped part of a larger Vintaj brass piece. 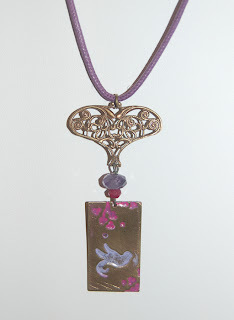 I chose faceted amethyst and garnet roundels for a bit of gemstone glamour, but you could use Swarovski crystals instead. 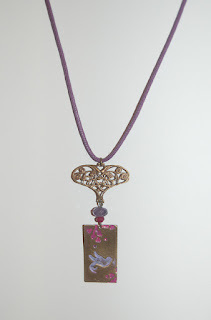 If you've been reluctant to try your hand at jewelry making, the embossed metal plates are a perfect place to start because they impart a one-of-a-kind look with very little effort. Okay, time to start those Autumn projects....love those warm, toasty, buttery colors of fall.